Our Field Trip Program is open to public, private and home schools. The half-day field trip includes two 45-minute class presentations, a lunch period and free time to visit the giant playground, farmyard, obstacle course, and camp store (open upon request). Our program is perfect for students in the 2nd through 6th grades. Our class descriptions below include recommended grade levels, though any class can be attended by any grade level. Our program can accommodate from 30 to 120 students. Please note, the 30 student minimum can be met by combining with another school already booked or by paying for 30 students. Picnics are open to private, public and home school groups at the end of May and early June. Picnics include general access to the camp facilities including: giant playground, farmyard, BMX track, obstacle course, pools, grass fields, hiking trails, and camp store (upon request). Your school can request program activities as well, like Zipline, Paintball Range, and Human Foosball for additional fees. You can also reserve rentals from our store like Archery, Dirt Boards, and Frisbee Gulf for a small additional fee and deposit. Pack your lunches and come out for a fun-filled end of the school year event! Add a push or a pull and there it goes! Don't worry, gravity and friction can make it stop. Potential energy and kinetic energy both have their parts to play. Your students will learn the basics of energy forces and how potential and kinetic energy are found all throughout their day in this exciting, interactive class. All animals need to fit in with their environment. In this class, your students will learn how animals adjust to the ever-changing environment around them and have a chance to investigate how each of the animals in our farmyard have adapted to their particular environment. Come and experience a day in the life of a Southern California Native American! Learn how Native Americans not only survived but thrived within their environment. 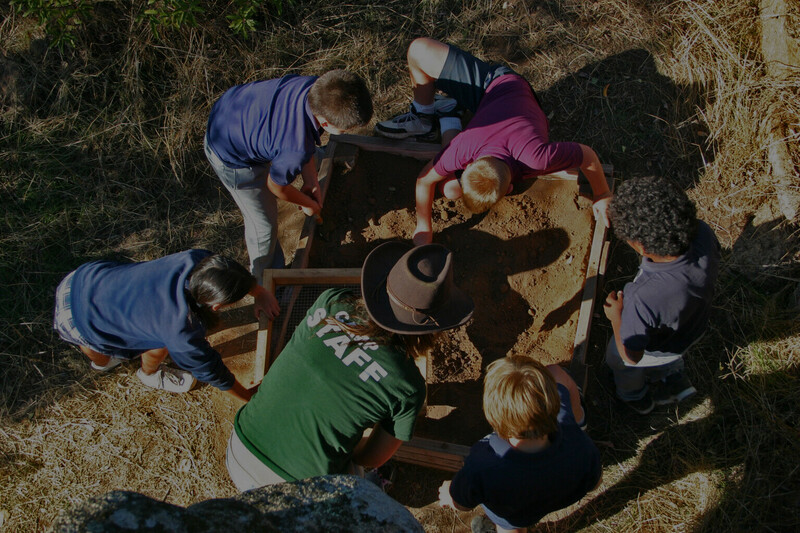 Your students will see artifacts discovered on our property and get to see the traces left behind by the Kumeyaay people who once inhabited this land. Southern California has a rich foundation of geological wonders and seismic activity. This class covers the basics of the rock cycle, as well as how plate tectonics can lead to earthquakes and volcanoes. Look out! This class also features a few volcanic eruptions! Rattlesnakes are the only venomous snakes in Southern California. This class features a safe look at some very fascinating creatures. Learning the habits, lifestyle, and behaviors of these reptiles will help your students better protect themselves, others, and the environment. Come and discover some amazing bugs that call San Diego home. Your students will get to inspect and interact with exciting and exotic real insects. The discovery of gold in California changed the state forever! Be a part of living history as your students pan for gold, learn about the past, and have their gold assayed. We hope they hit the "mother load!" Everything is connected! Your students will see how energy passes from the sun to Earth's diverse organisms. Your students will learn the critical role each organism plays in its ecosystem, no matter how big or small. Take a trip out west with early American settlers. Your students will learn what it takes to survive in the harsh conditions of the Overland Trail System. After they learn the basics they will have the chance to step onto IHC's own Overland Trail! You will receive one free teacher/chaperone per 8 students. A minimum of 30 students is required to book (or minimum fee of $450). This minimum may be met by booking on a date with another school. Field Trips are available Tuesday through Friday in September, February and March. Field Trips may be scheduled in April and May upon special request. Step 4: You will receive a contract, per your selections. Sign and return your contract, along with a $75.00 deposit, to secure your date within two weeks. Step 5: Arrive at camp! Step 3: You will receive a contract once your request is received. Fill out, sign and return the contract, along with a $75.00 deposit, to reserve your date. Step 4: Arrive at camp! Schedule is subject to change--a final schedule based on your needs and camp availability will be provided upon check-in on the day of your Field Trip at IHC. * Each student and chaperone should bring a lunch and plan on a 30 minute lunch period. If you need to arrive later or leave earlier due to transportation, please notify the registrar in the booking process.